The black teen was shot by a white police officer this summer. THE GOVERNOR OF the US state of Missouri has declared a state of emergency and activated the National Guard ahead of a grand jury decision in the case of a black teenager shot dead by a white policeman. There are fears of a renewed outbreak of violence if the St. Louis County grand jury fails to indict Ferguson police officer Darren Wilson in the August 9 death of 18-year-old Michael Brown. In his formal declaration, posted on his website, Governor Jay Nixon said “there is the possibility of expanded unrest” when the grand jury hands down its decision. No date has been announced for the grand jury’s decision, but St Louis. County officials have previously said it would come by mid- to late-November. “The state of Missouri will be prepared to appropriately respond to any reaction,” said Nixon, adding that citizens’ rights to “peacefully assemble and protest” would be protected. Nixon also activated the Missouri National Guard to back up local and state police if needed. 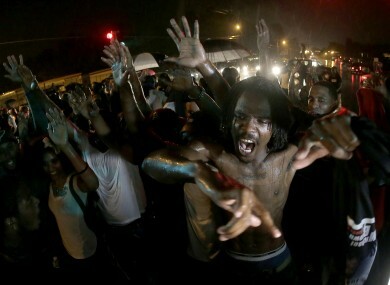 Brown’s death touched off weeks of sometimes violent unrest in the St Louis. suburb of Ferguson as well as a national debate about race and law enforcement in America today. The US Justice Department is undertaking a parallel investigation into possible civil rights offenses on the part of the Ferguson police department. Authorities and residents in Ferguson – a suburb of 21,000 with an African-American majority and an overwhelmingly white police force – have been bracing for the outcome for weeks. “Quite simply, we must and will be fully prepared,” Nixon previously said. Speaking earlier this month, the Democratic governor said more than 1,000 police officers had undergone extensive specialized training over the past two months. Some US media including CNN have reported a surge in gun and ammunition sales, as residents and business owners seek to protect themselves in the event of renewed violence. Brown, a high-school graduate looking forward to attending technical college, was shot at least six times by Wilson and his body left in the street. Wilson has reportedly told the grand jury that he acted in self-defense after tussling with the youth. Others claim Brown had his hands in the air when he was shot. In the United States, grand juries – which meet in secret – are sometimes used to review a case before deciding whether criminal charges should be sought. In the Ferguson case, the grand jury could indict Wilson, meaning he could face trial, or determine there is no case for him to answer. Email “Missouri declares state of emergency ahead of Ferguson verdict ”. Feedback on “Missouri declares state of emergency ahead of Ferguson verdict ”.